In the wild, whitetail deer food consists of a variety of grasses, woody vegetation, and various types of foliage. They will also eat seeds, fruits, and mosses. The particular type of each of these foods varies by region and season. Whitetail deer in the desert will eat prickly pear cactus and other shrubs able to endure the intense sun. 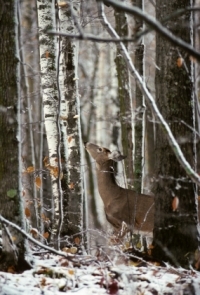 In Michigan, the whitetail deer prefers white pine, cedar, sumac and other species native to the area. In the spring, deer feed on available forbs, which are flowers and herbaceous plants. Whitetail deer are always attracted to fields planted by farmers also. 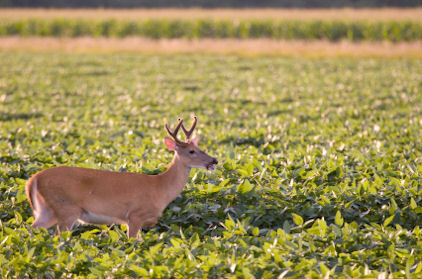 In some states, agricultural crops account for over 50% of the deer's diet. For example, in Iowa the corn fields make up close to 40% of the deer's diet. Whitetail deer are adaptable forgers and will browse an area until it has been decimated. When this happens the deer do not get proper nutrition, and the area is stripped of deer attracting foods. It should be mentioned that deer are called ruminants. A ruminant is an animal with a four chambered stomach. The forging whitetail deer can eat food and store it in one stomach to be chewed and digested later. It does this by chewing the food just enough so it can pass down the esophagus into the first stomach. Later on the deer will lie down and regurgitate the food as cud, where it is chewed enough to be completely digested by the second, third and fourth stomachs. Whitetail deer must drink water every day. Hunters should search for large whitetail deer wherever there is a waterhole, creek or stream with plenty of natural vegetation. Managing whitetail deer hunting lands often includes establishing food plots. Food plots are areas that have been planted with nutritionally balanced seeds and plants. This practice not only attracts deer, it can create the perfect diet for growing large record making and healthy deer. As mentioned earlier, deer will browse until most of the nutritional plants are gone. Food plotting is a way to re-establish natural grazing grounds. Diet determines the quality of antlers on a whitetail buck. Antlers are mostly protein, so a whitetail deer needs to eat up to 20% of its diet as digestible protein. The deer also needs calcium and phosphorous for high quality antler development. Whitetail deer food in North America is often a combination of native vegetation and human plantings introduced into their habitat. Understanding how deer feed is critical to hunting success.